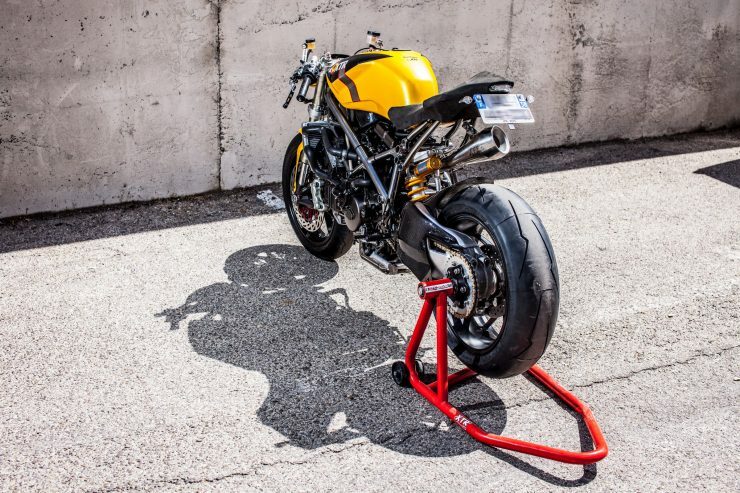 The Ducati 848 was released in 2008 as a replacement for the outgoing Ducati 749, the new model quickly gained legions of fans thanks to its all-new engine – a lightweight 122 rwhp 849cc Ducati L-twin. 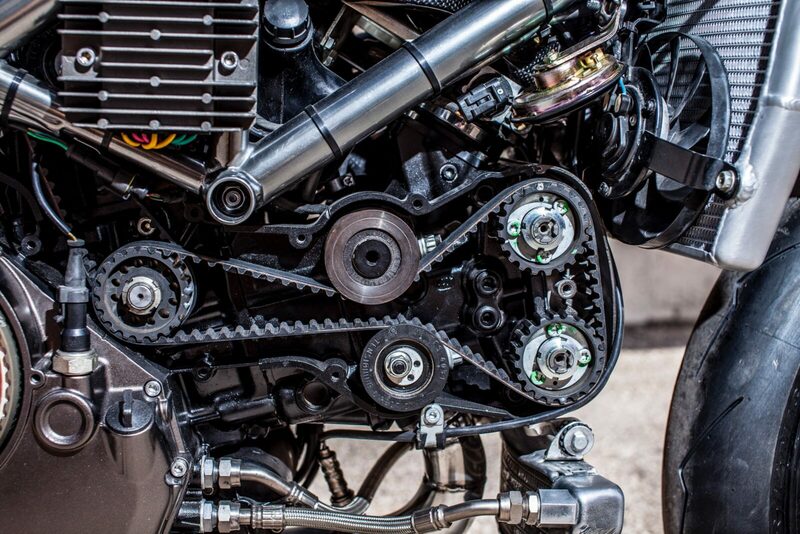 The eagle-eyed among you may have noticed that I said L-twin rather than V-twin, this wasn’t a typo – Ducati call their engines L-twins as there is a 90° angle between the cylinders (creating an “L” shape), and because it allows them to separate themselves a little from other V-twin manufacturers like Harley-Davidson, Indian, et al. Unlike its predecessor the Ducati 749, the 848 had an engine designed specifically for it – rather than just a shrunk version of the larger engine, as was the case with the 749 and it’s larger sibling the Ducati 999. 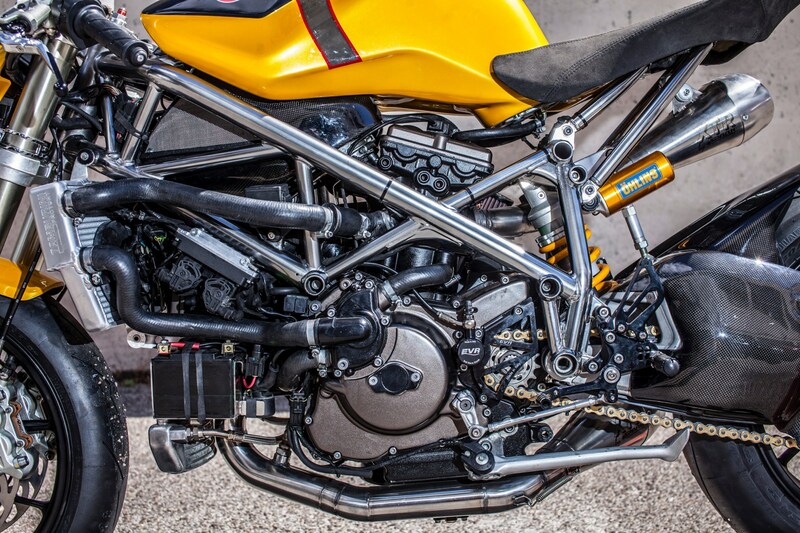 The benefit of this all new engine was twofold, it provided more power, and it weighed less. 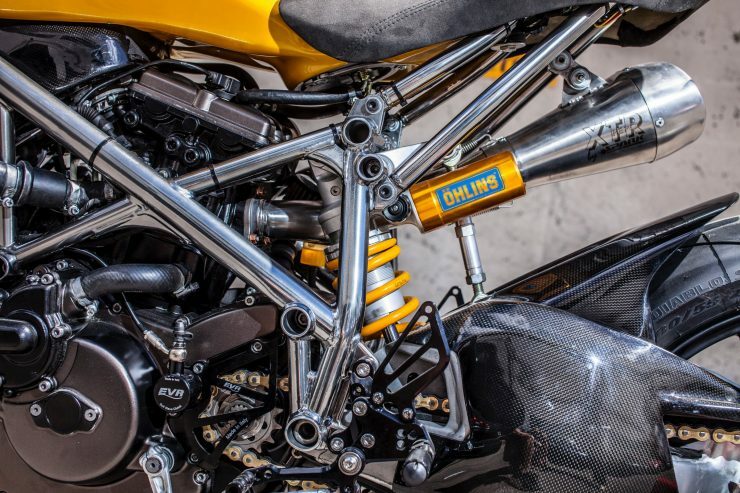 Many who rode both the 848 and the Ducati 1198 preferred the former as it was a few pounds lighter, it had a wet clutch in place of a “rattletrap” dry clutch, it was cheaper, and with 122 horsepower at the rear wheel it had ample power for everything this side of a MotoGP starting grid. 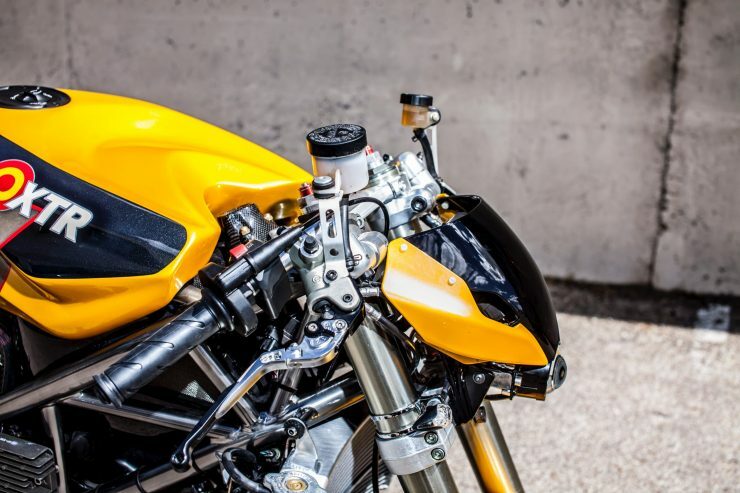 As with many modern Ducati engines the 848 is an L-twin with four desmodromic valves per cylinder, it’s liquid-cooled, fuel injection, and it has a 6-speed gearbox. The dry weight is 168 kilograms (370 lbs), it has front and rear adjustable Showa suspension, front and rear Brembo brakes, and for those who care about such things, it has fuel consumption of 5.3 L/100 km or 44 mpg (US). 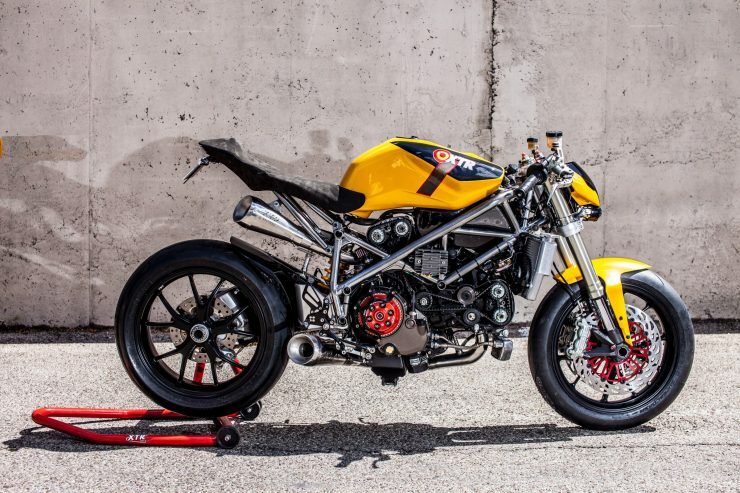 The Ducati 848 would stay in production from 2008 till 2013, and as a result of their popularity it’s possible to find them on the secondhand market with reasonable mileage, and most of their depreciation done on someone else’s dime. 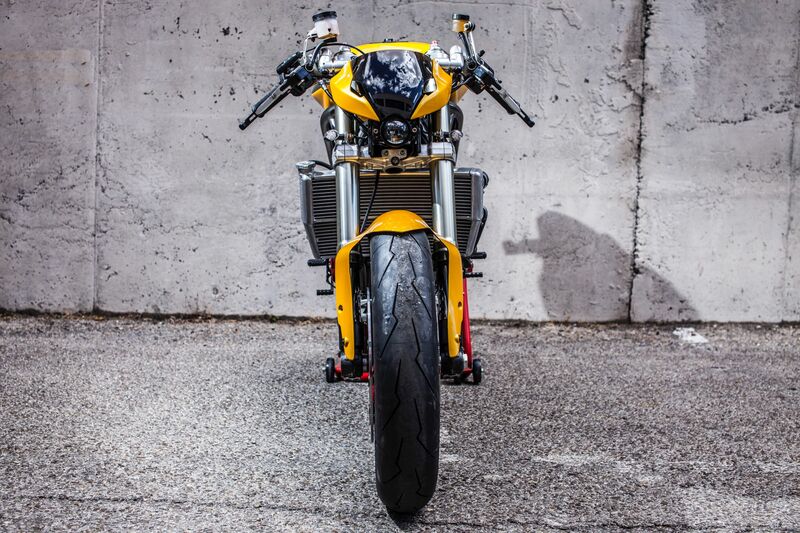 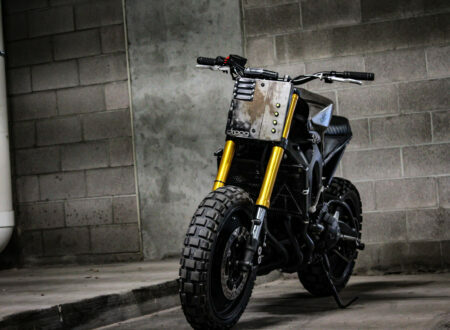 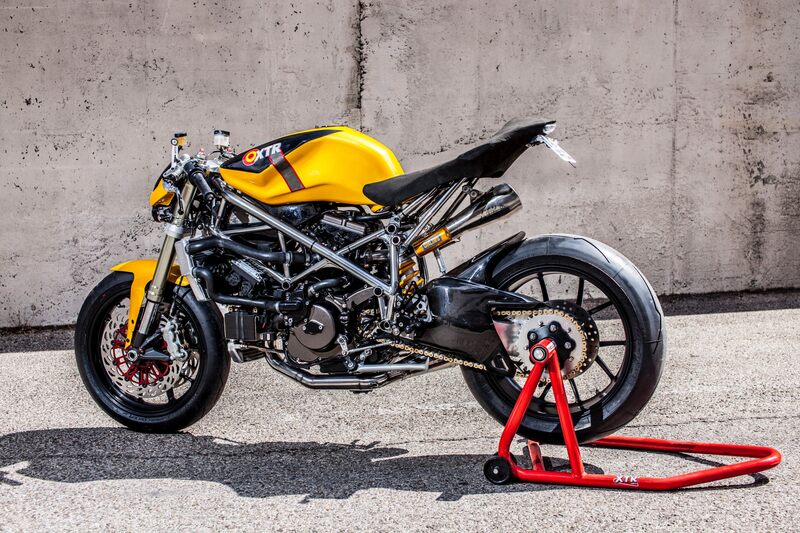 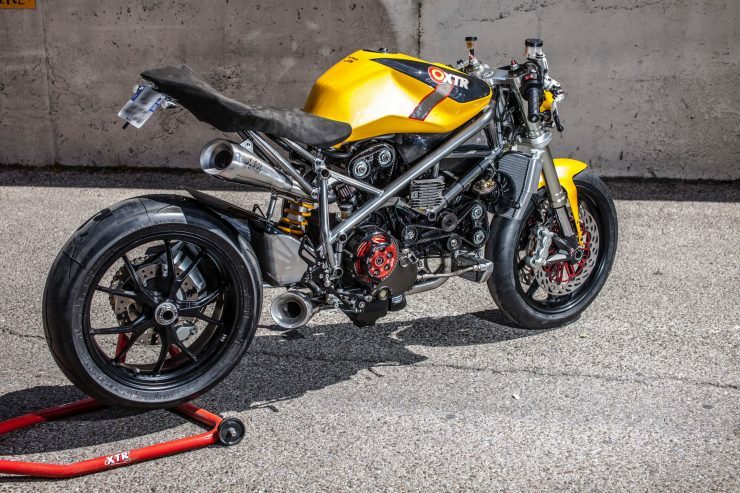 The street fighter you see here is not one of the factory built examples of the 848 Streetfighter, it’s an entirely custom built bike using an original 2010 model as a base. 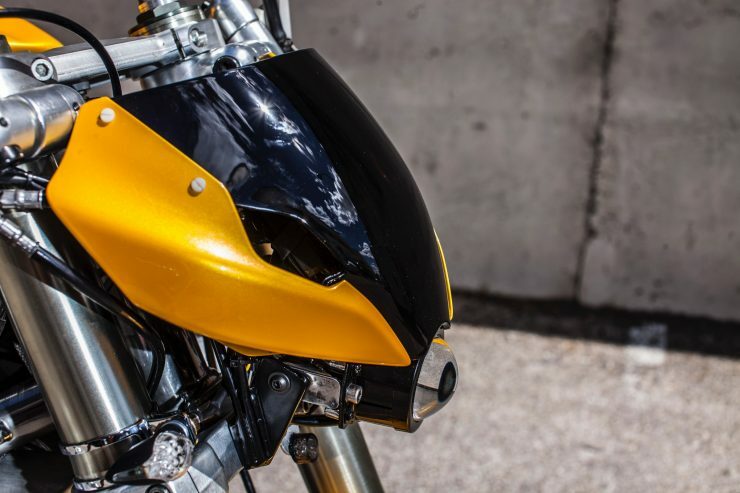 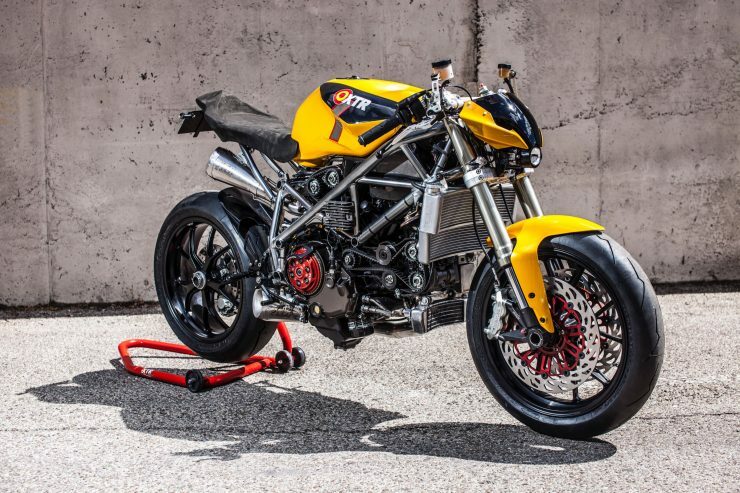 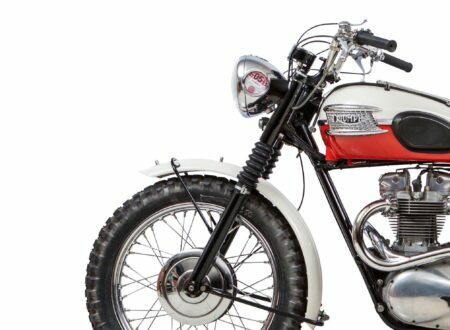 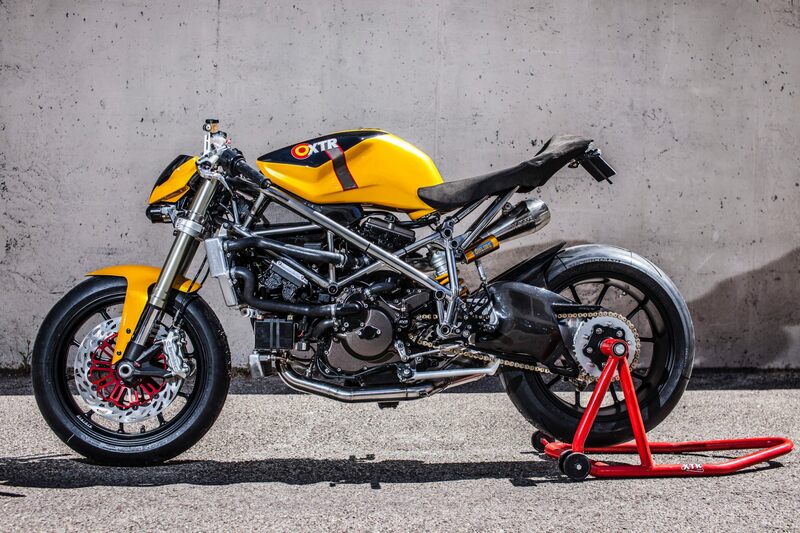 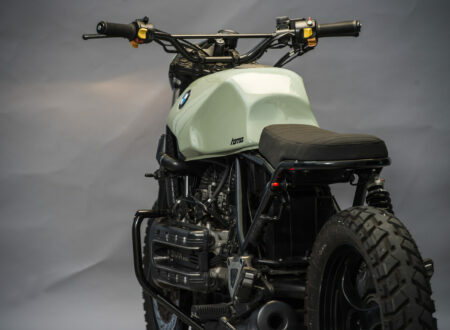 The build was completed by legendary Ducati builder Pepo Rosell of XTR Pepo, funnily enough Pepo didn’t start out as a bike builder, he’s a trained biologist who previously worked on fish farms before turning his two-wheeled hobby into a full-time business. As with all of Pepo’s builds, this one began with a full teardown followed by a careful rebuild to minimize weight and maximize power. 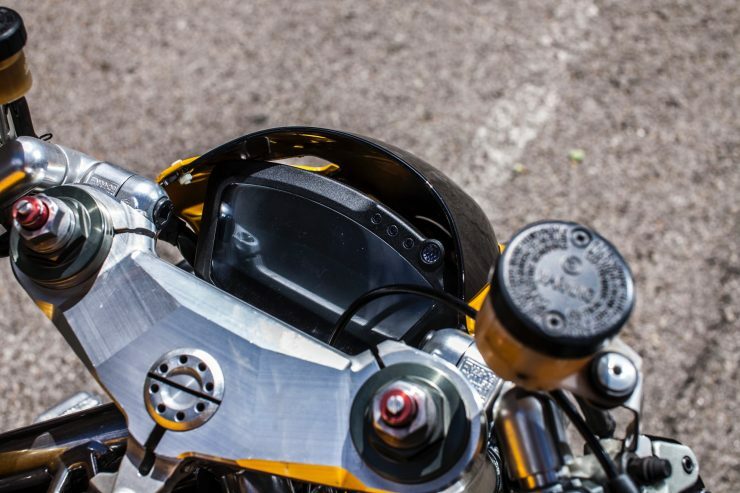 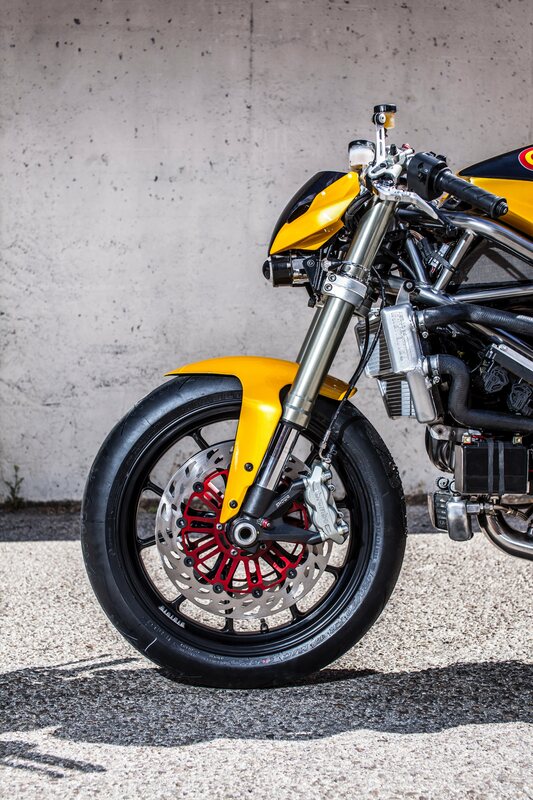 A pair of eye-catching Discacciati brake rotors were fitted up front, with Frentubo Kevlar brake lines, and adjustable levers. 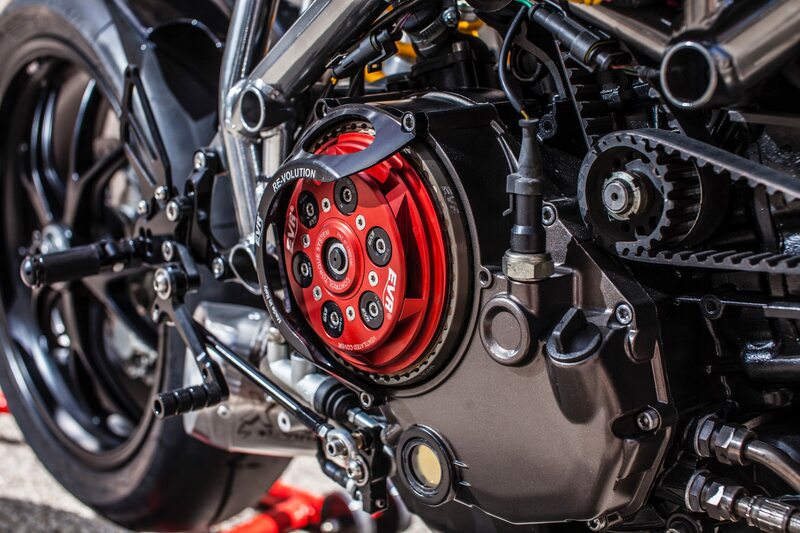 The original clutch was swapped out for a Frentubo Kevlar clutch, it was converted from wet to dry with a EVR antihooping clutch kit. 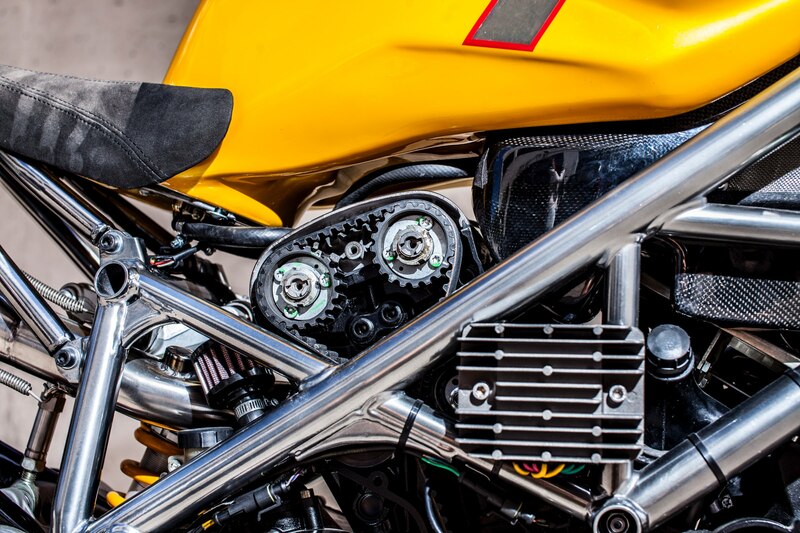 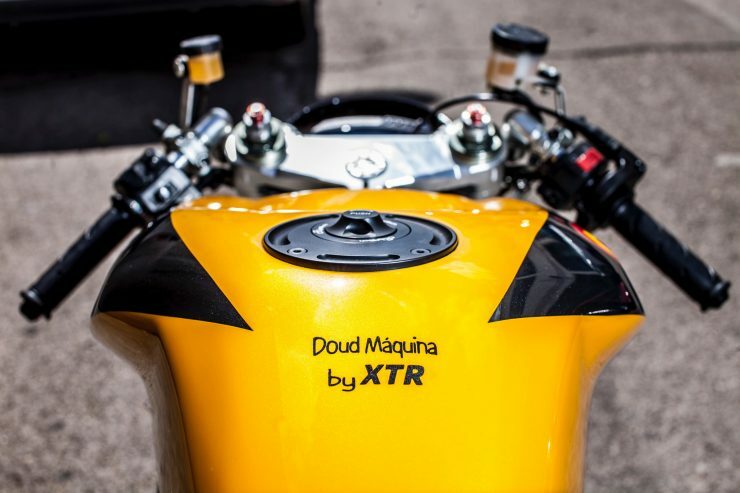 The engine received a significant re-working, including ported heads, a 1098 throttle body, a custom XTR carbon airbox, CNC machined air intakes and injector holders, XTR air filters, and an EVR programmable ECU. 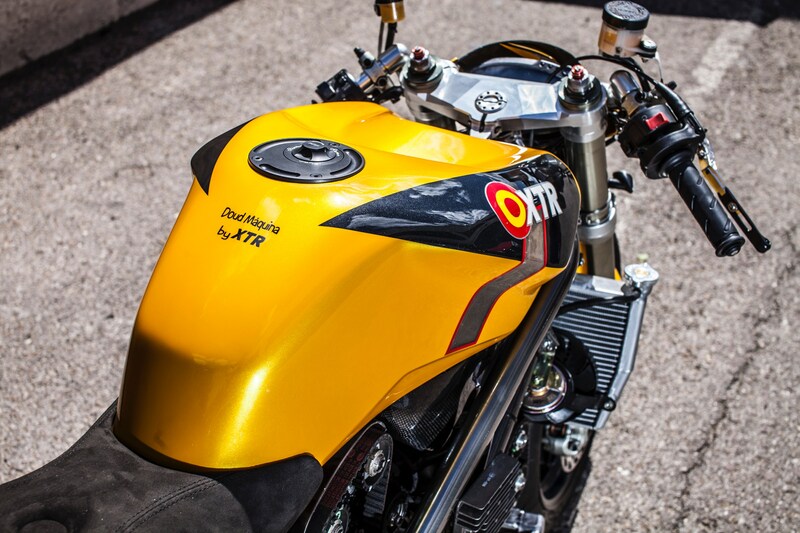 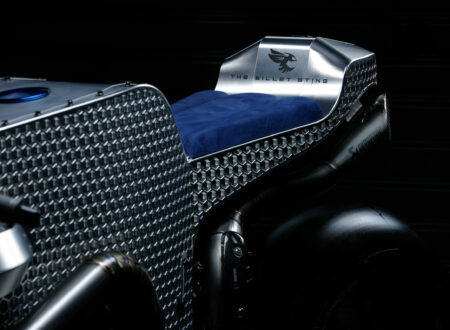 A Super Mario exhaust system fitted with SPARK megaphones, and a new (much larger) Tamburini race radiator was installed. 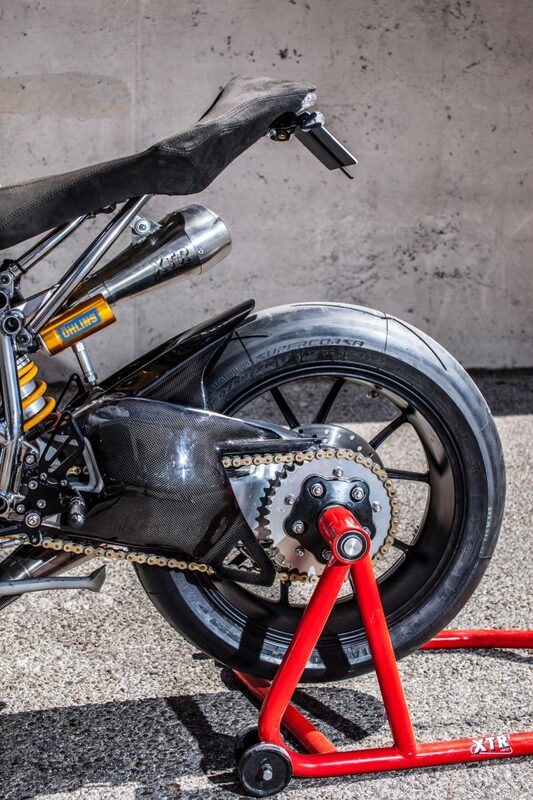 In the rear there’s a new carbon fiber swingarm to reduce unsprung weight, a new Öhlins monoshock, and there are Pirelli Supercorsa tires fitted front and back. 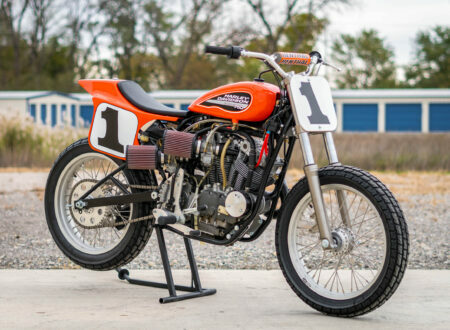 The completed bike is now notably faster than it was stock, and more than capable of throwing down with its larger brother at the track. If you’d like to see more from XTR Pepo or contact Pepo Rosell for your own build you can click here to visit his official website.